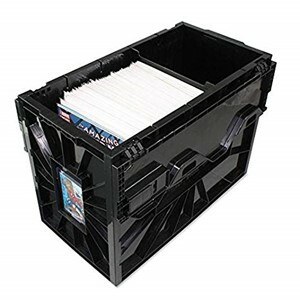 The BCW Short Comic Bin is a heavy duty comic box made from acid-free, reinforced, snap-together plastic panels. The Comic Bin holds about 150 bagged and boarded comics and includes a movable partition that helps stand up your growing stack of comic books. Identification slots on the ends help you mark your boxes with either an index card or a toploading card holder. The lid panels feature sliding locks for added security.